Sprinting In High Heels: Bring The Party! Last fall I set out for a wine adventure with my mother in tow. We took one for the team touring and tasting our way across the North Fork of Long Island. One very bright spot along the way was Pugliese Vineyards, owned and operated by the Pugliese family. 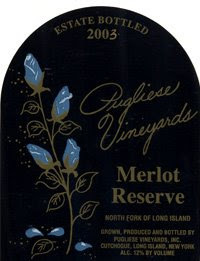 With Memorial Day Weekend approaching, and the host of summer parties that will undoubtedly follow, I felt it was time to dust off a few bottles and share my favorites with the blogosphere starting with Pugliese Vineyards' Merlot Reserve, and at only $16 it is a steal for all of the body and flavor that comes along for the ride. Perfect with a steak or a juicy burger this bold varietal goes with anything, or nothing at all. You know those night when you are exhausted, physically and mentally and just want to unwind with a great glass of wine, uncork this one. Just stir all of the ingredients together until the sugar has dissolved, add ice, and enjoy. 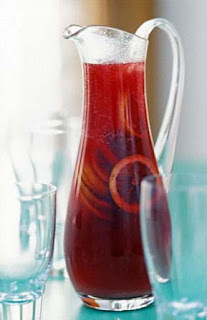 With a party punch like sangria just use what you've got on hand - add blackberries, limes, blueberries, whatever you like best. The more bold the fruit add a bolder wine to keep the flavors in balance. This is best if you make it in the morning and let the flavors steep together before adding the ice for and afternoon BBQ (that is if you can wait that long). Three cheers to your Memorial Day festivities! Some purists among us would say, "How dare you turn fine LI wine into a mixed drink." Delish recipe none the less.